Spring has finally sprung, and there’s no shortage of celebratory events in New Orleans! The warmer weather is a welcome change of pace for residents and tourists, both of which are finally free to stretch their legs without fear of frostbite. They may even work up a sweat. Sure, if you’re a springtime visitor you’ll have missed Mardi Gras, NOLA’s signature event. Luckily, there’s a host of other attractions and activities you’ll enjoy even more with a warm breeze in your hair and a spring in your step. Here are 5 things to do this spring in New Orleans to make the most out of the season! 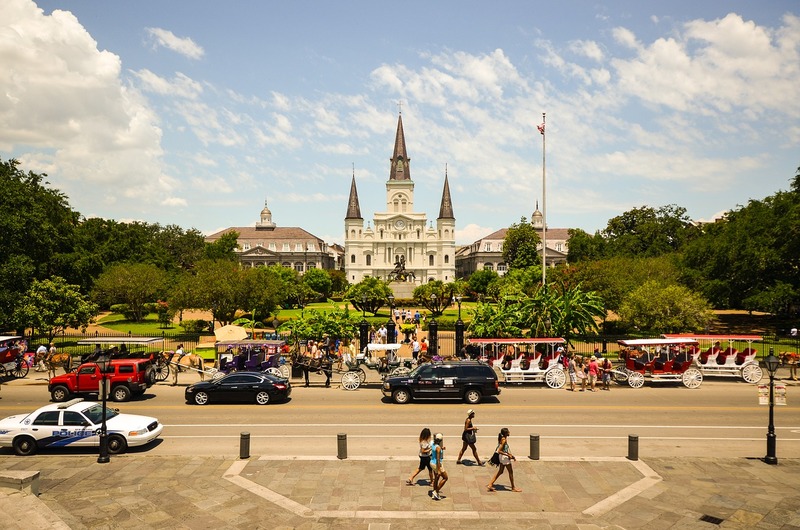 Jackson Square is the main square in the heart of the French Quarters, and though it’s lovely during every season, residents and tourists will both want to spend some time enjoying the views after spring arrives. Originally known as Place D’Armes, Jackson Square is bordered by and in close proximity to other beautiful attractions like the St. Louis Cathedral and Moon Walk Promenade. You know who else likes springtime? Animals at the Audubon Zoo. Spring is the perfect season to visit NOLA’s giraffes, jaguars, elephants, orangutans, alligators… and the list goes on. The Audubon Zoo is an ideal escape outside the busy city, and a great way to get some post-winter exercise in before summer. Just because you can take a boat tour in the winter doesn’t mean you should. Springtime brings NOLA’s swamps to life and provides the perfect climate for bayou boat tours, of which there are many to choose from. After Mardis Gras, NOLA’s most anticipated event is probably the New Orleans Jazz & Heritage Festival, also known as Jazz Fest. From April 28 to May 7, the event draws huge crowds to the fairgrounds for a wondrous array of music and food. This year’s lineup includes Tom Petty & the Heartbreakers; Earth, Wind, and Fire; and Dave Matthews and Tim Reynolds. Jazz not your thing? If you’re a true southerner, or southern wannabe, country may be your thing. If that’s the case, NOLA’s Bayou Country Superfest may be just the event you’re looking for. Formerly Baton-Rouge Based, the event has moved to New Orleans for 2017, and will take place over Memorial Day weekend. The celebration will feature country superstars including Miranda Lambert and Blake Shelton.